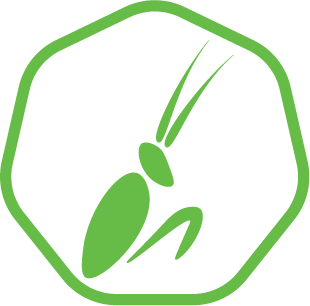 We wanted to incorporate quorum sensing (QS) to make Mantis more robust, increase sensitivity, and amplify responses such that Mantis can sense very low antigen concentrations. QS allows bacteria to communicate by producing the signaling molecule AHL . To achieve our goal, we use a QS system that allows cells to signal the presence of antigen to the entire cell population. After detecting the antigen, a cell will start producing LuxI, the enzyme able to generate the signaling molecule AHL. AHL will diffuse out of the cell into the external medium. When it enters a neighboring cell, AHL can bind with LuxR to form an active transcription factor (TF). The TF activates production of the lysis protein LysE7, causing the cell to lyse. There are two subpopulations of cells; one containing TEV protease and the other containing a quenched form of GFP. The GFP domain in this protein is fused to a REACh domain, preventing fluorescence . Upon release, TEV protease cuts the GFP free from the REACh domain, leading to a fluorescence signal. An overview is visualized in Figure 1. More details are available on the wet-lab results page. Figure 1: The components of the Mantis QS and lytic system. Antigen will activate QS (left). QS will initiate cell lysis (middle). Cell lysis will result in a fluorescent signal (right). In green dots an entire fluorescent molecule (GFP) is depicted. We selected an existing QS BioBrick containing a LuxI in a positive feedback motif as the starting point for our project. This BioBrick, BBa_K1913005, also contains GFP under the same promoter as LuxI. The amount of fluorescence is therefore a reporter for the degree of LuxI production. The more the cells engage in QS, the more fluorescence they produce. Previous experiments have shown that BBa_K1913005 produces fluorescence even at low cell densities. This suggests that leaky expression of LuxI and high basal levels of LuxR will result in a significant amount of GFP production. The goal is to construct a variation on this part that no longer has spontaneous activation, but can be induced by an outside mechanism, for example by Cpx. To confirm the properties of BBa_K1913005 reported in the repository, we first analyzed the fluorescence produced by cells containing this BioBrick. As a negative control, cells containing pLuxR-GFP, as well as cells containing pLuxR-GFP and pLuxL-LuxR (i.e. BBa_K1913005 without LuxI) were also analyzed (Figure 2). This indicates that cells containing BBa_K1913005 auto-activate and produce the active TF LuxR-AHL dimer. Without LuxI, there is no AHL production and there is no active form of the LuxR transcription factor. Our goal now is to make an inducible version of BBa_K1913005 that initially produces no GFP, but that can be activated. The BBa_K1913005 BioBrick functions properly only as a reporter for QS. As it always engages in QS, it cannot be used in systems that require QS in specific cases. Our goal is to fix the behavior of BBa_K1913005 so that the QS mechanism can be applied as an amplification mechanism in whole-cell biosensors. Figure 2: Relative fluorescence produced by cells containing BBa_K1913005 (Reporter Quorum Sensing), pLuxR-GFP, and pLuxR-GFP & pLuxL-LuxR (Negative control 2). 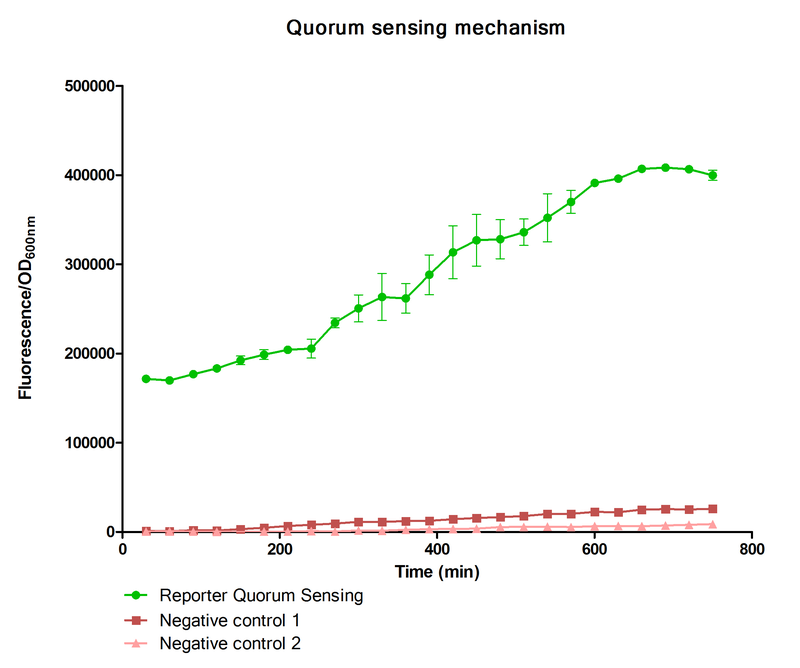 In parallel to the wet-lab experiments, we developed a mathematical model of our quorum sensing system. In the model, certain parameters resulted in behavior qualitatively similar to our wet-lab results. We identified parameter sets that were able to qualitatively produce the desired wet-lab results (Video 1). The leaky expression of LuxI resulted in fluorescence despite the fact that LuxI production was never induced. Video 1: The left window shows the cells in orange and the signaling molecule AHL in blue. On the right is visualized produced fluorescence. The animation starts at t=55 and ends at t=120. The duration of the complete simulation was 150 time units. The parameter space showed the important role of certain parameters in preventing spontaneous auto-activation. From model simulations, we found that a low rate of cellular AHL degradation is associated with spontaneous auto-activation. A potential method of controlling this parameter in the wet-lab is to use the enzyme aiiA, capable of degrading AHL. The role of using aiiA to combat leaky expression has been explored by previous iGEM teams; for example, ETH Zurich.”. We first explored the effect of adding aiiA to our spatiotemporal model. Reaction rates for aiiA were added to the model and parameter sets that resulted in spontaneous lysis were simulated (Video 2). This demonstrates that aiiA can prevent fluorescence from being generated in the absence of GFP while still maintaining the generation of fluorescence in the presence of antigen. Video 2: Fluorescence produced by the original system (top) versus the system with aiiA included (bottom). On the right side is shown the system induced with antigen. On the left, the system in the absence of antigen. We were able to tune the kinetic parameters of aiiA so that aiiA would prevent spontaneous auto-activation caused by leaky expression while not preventing the detection of low levels of AHL produced by neighboring cells (Table 1). Table 1: A system with negatively regulation of LuxR that self-activated spontaneously was modified by adding aiiA or increasing the degradation rate of LuxR, resulting in the desired behavior. These modeling results support the strategy of using aiiA to tune the sensitivity of the QS construct and indicate that, in principle, the functionality we want to engineer can be obtained using only the components we are using. Inspired by the modeling result, we decided to add aiiA to BBa_K1913005. The aiiA gene had to be controlled under an inducible and tight promoter. We used the pTet promoter to regulate aiiA, causing aiiA to be produced constitutively. To turn on fluorescence, aiiA production can be halted by introducing the TetR protein, which represses production from the pTet promoter. This construct was submitted as a new BioBrick BBa_K2387070 (Figure 3). Figure 3: aiiA mechanism controlled under the pBAD promoter. Left) No induction state, aiiA expression is triggered by pTet. Right) Arabinose activates the pBAD promoter leading to the expression of tetR which inhibits pTet, avoiding suppressing the expression of aiiA and leading to the formation of the LuxR-AHL dimer which further binds to pLux, leading to activation of the quorum sensing system and GFP generation. Production of TetR is regulated by the inducible promoter pBAD. Addition of L-Arabinose should lead to production of TetR. TetR can then bind and repress pTet, halting aiiA production. Lower levels of aiiA in the cells would mean higher levels of AHL, which should then lead to auto-activation and production of GFP. In this way, addition of L-Arabinose should induce a fluorescent signal. The fluorescence of this new construct was measured alongside the old construct and the negative controls (Figure 4). 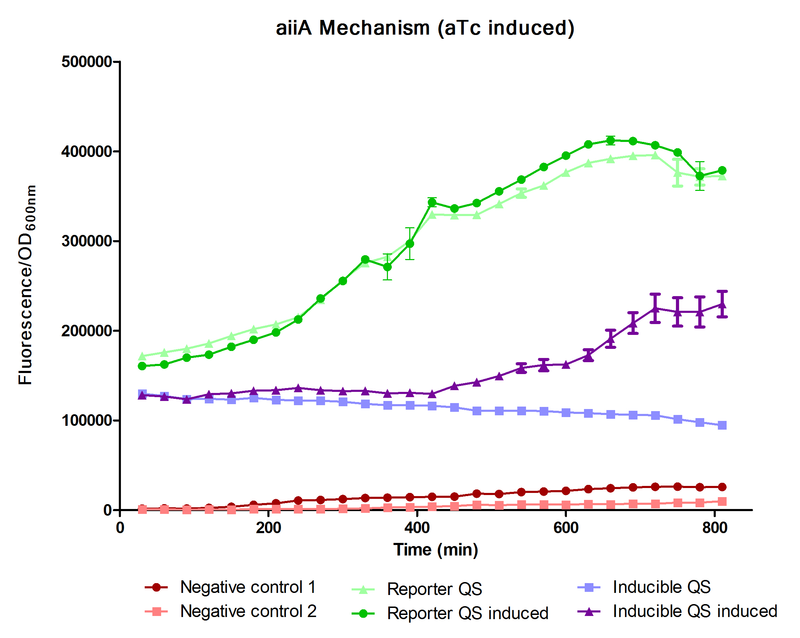 Figure 4: The fluorescence produced by cells containing the Reporter QS (BBa_K1913005), Inducible QS (Reporter QS with repressible aiiA BBa_K2387070). L-Arabinose was added to the 'Induced' cells negative control 1 encodes only for GFP, negative control 2 for both GFP and LuxR. For Mantis to have a high sensitivity, we need a system that can increase fluorescence production specifically in response to detection of antigen. We determined that QS could be a good strategy to achieve this. Our goal was to engineer a construct where QS could be induced, for example by Cpx or by addition of L-Arabinose. We started off with a QS system that always produces fluorescence. The goal was to reduce the sensitivity to AHL. Through the mathematical model we discovered that aiiA can be used to tune the sensitivity of the QS system. Inspired by our model, the BioBrick BBa_K2387070 that allows for inducible repression of aiiA production was engineered. By combining our BioBrick with the existing QS reporter BioBrick BBa_K1913005, we managed to induce fluorescence by addition of L-Arabinose. Our module was therefore able to detect L-Arabinose and turn on QS. Thus, GFP was produced when required. Our BioBrick allows the engineering of whole-cell biosensors that incorporate QS as a means of signal amplification or to synchronize the reporter system across an entire population. For this BioBrick to work with a detection module, that module has to trigger TetR production upon detection. In doing so, QS will be triggered, resulting in a fluorescent signal. Miller, Melissa B., and Bonnie L. Bassler. "Quorum sensing in bacteria." Annual Reviews in Microbiology 55.1 (2001): 165-199. Ganesan, Sundar, et al. "A dark yellow fluorescent protein (YFP)-based Resonance Energy-Accepting Chromoprotein (REACh) for Förster resonance energy transfer with GFP." Proceedings of the National Academy of Sciences of the United States of America 103.11 (2006): 4089-4094.